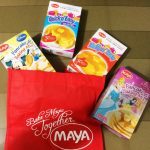 We joined 11 mommy bloggers in The Maya Kitchen Baking Workshop last Saturday. This workshop was in collaboration with the Mommy Bloggers Philippines (MBP). We were divided into four groups with three mom-child tandem each. There, we learned how to make Strawberries & Cream and Peanut Butter & Choco Chip cupcakes. 4 values at The Maya Kitchen Baking Workshop| Group 2 with fellow mom bloggers Yvette (white polo)) and Joyce (red polo) and their boys Yuri (yellow shirt with glasses) and Ross (red shirt), respectively. Thanks Joy for the beautiful photo. Also, we were able to bring home our cupcakes and share them with our loved ones. And my two other boys were all in awe looking at our pasalubong. They kept on asking if it was really their younger sibling who made the cupcakes. And for the nth time, I said yes. Funny that even our little nine-month-old baby cannot resist the cupcakes! Again, just like in his Brotzeit Junior Chef stint, my boy’s self-confidence improved. He proudly shared his cupcakes with his family. He knew his Kuyas and papa will appreciate the baked goodies because they are indeed beautiful and yummy. My boy shared the working table with two other boys and their moms. And he felt empowered as the other moms let him do his own share to make the batter for the cupcakes. The same way he let his teammates do their own whipping and folding (the batter). He trusted them the same way they trusted him. I saw teamwork in them. My son can be impatient. He would eagerly do things that excite him. Last Saturday, his patience was tested. He needed to whip more to make a better batter and he needed to press more for the whipped cream to come out beautifully. This mother is really poor with directions that because we can’t find a cab to bring us at the Maya Kitchen headquarters, we walked from Ayala MRT station all the way to the baking workshop venue. We closely examined each tower, making sure we didn’t miss the building number. It was really a long walk thus, we were late. It took us about 20 minutes to reach the place. A day after The Maya Kitchen Baking Workshop, we were invited to a birthday party. Because of what happened yesterday, my son recommended that before we leave for the birthday party, we google the place so that we will not be lost. Good thing though my kind mother offered us a ride. My ever loving baker and his ever-supportive little brother. 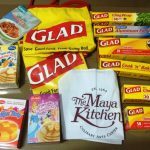 We’ve got a few boxes of Maya baking mix and pancake mix and also a good number of Glad Kitchen products. And this momi has a new cookbook from Yummy Magazine. Yey! This morning, we had pancakes for breakfast and we used our take home whipped cream. The boys got to decorate their pancakes with chocolate frosting and strawberries and cream. And as we ate, my 10-year-old boy kept on repeating how he and his classmates prepared the whipped cream and how they piped the peanut buttercream on top of the cupcakes. He is truly proud and delighted with his achievement. This mother is just so happy his son appreciated the baking workshop. So for moms who would like to enlist their children to The Maya Kitchen Baking workshop, you may check the schedules here. I assure you, the workshop is worth your time. It’s worth our 20-minute walk! By the way, our heartfelt thanks to MBP, Yummy Magazine, Glad Kitchen and The Maya Kitchen. I really like such activities for kids. I hope me and my son will be able to get involve into that kind of activity in the future. That sure is a one good bonding for you two too! Such a nice bonding activity with kids. And they get to learn new things as well. He enjoyed his short stint as a master baker and I hope he will still remember this even if he grows up na. And you’ve got a very cool and kind mind to let you roam in the kitchen and even support you of your European taste. I have two boys and they are more into eating than into baking. I would love them to spend time baking with me as well. For the mean time, I’ll have to enjoy movie nights as my primary source activity for bonding time with my kids. Movie nights is indeed a nice bonding activity with our little darlings. And yes, kids love to eat than help with the kitchen. But time with come they would appreciate baking as well. Wow! Good job kuya! It is such an exciting bonding activity with the kids. Congrats to our achievement little kiddo. Haha. Yes, congrats to the achievement. I’m happy for you and your son! 🙂 I wanted to join that activity but we had prior commitments. We are new to baking also. We have tried to bake several times since the year started and we are definitely having fun! Hope to join the next activities with other mommy bloggers and their kids. Yes, lucky us to have a spot for that baking class. It was fun indeed. And hope to bake with you soon. Lovely! It’s great that kids get to try baking. I wish I tried it when I was younger. Makes for a good summer activity! I wasnt into baking too until recently. You could always try baking. It surely is fun. I, too, brought home those lessons. And yes, socializing and how to deal and mingle with others is a lesson learned too. Instead of simple learning the skill and simply having fun, you found lessons and when you talk to your kids about it, they learn. That is parenting. Good job, Berlin. Thank you. It was indeed another opportunity for the boys to learn or remind them of the importance of those values. He indeed had fun and so proud of his cupcakes. Ihihi. What a wonderful way to bond, learn new skills and to socialise with other parents with similar values! Cooking for me is very relaxing; good work! Yup, indeed a nice way to bond and relax. This is definitely a great way for mom and kids to bond! Not only will you teach your kids baking, but also the importance of patience and cooperation too. Baking is also a bit like chemistry–one mistake and it all goes awry! Haha. Nice analogy. Agree with the chemistry thing.